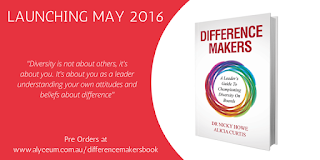 Nicky Howe - Leadership and Management Coach: What is the Directors Role in Diversity? What is the Directors Role in Diversity? A key part of any Directors role is the lead themselves and to lead others. Difference Makers: A Leader’s Guide to Championing Diversity on Boards invites directors to firstly explore their own commitment to diversity and then provides valuable insights into how to lead others in the boardroom. Fundamental to this is how good boards put time and effort in working together to develop a high performance environment. This means that every director not only the chair, deputy chair, treasurer or secretary can make a difference, every director needs to be a diversity and inclusion champion. What is the Director’s Role in this? Your role as a director is to work with the others to create an engaged, inclusive culture. You want to be part of creating a board environment that is inclusive. In order to influence inclusive and exclusive behaviours you need to understand what factors inhibit or enhance these behaviours. You have to recognise what habits you need to create in relation to your behaviour and the behaviours of other directors. Creating a board charter that sets out the board’s purpose and defining the shared values (which will be drawn from the organisational values). Articulating how directors will communicate with each other. Setting out how directors will behave and what the other directors will do when members do not behave to the agreed standards. Expressing what are the positive habits members will adopt as part of their directorship. Another important element of a high performing board is its ability to create a new type of culture required in modern governance and one which Nadler describes as an ‘engaged’ board. A board culture is the result of a group of people having a shared set of values and from this, the group determines what are appropriate and inappropriate behaviours in particular situations. The shared values are reflected in the beliefs and norms of each director and in-turn the whole board. Difference Makers sets out these board values and norms to support director who seek to behave in line with these characteristics. We know that not every board director will, so your role as a leader is the process of social influence, to maximise the efforts of other directors, to achieve the organisation’s objectives. Difference Makers offers various resources to support you in developing your commitment to diversity so you can lead a more diverse and inclusive board room. 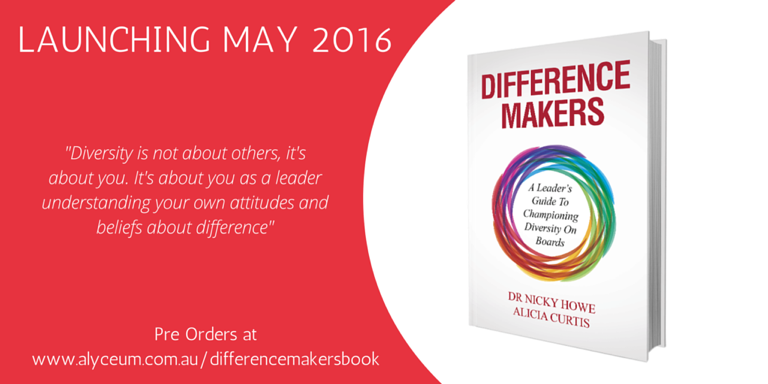 Join us in championing diversity on boards – become a Difference Maker. Difference Makers reframes the debate about who can participate in a board directorship so that differences are not seen as negatives but as positives. Dr Nicky Howe and Alicia Curtis share their experience and research on how different points of view and different experiences can enhance problem-solving and spark innovation; it can build better boards and ultimately better organisations. Get your copy at here. Launching May 2016.